In 1994 the Northridge earthquake in Los Angeles damaged part of that city’s freeway system. There was little public debate about rebuilding the freeways, and the damaged I-10 in Santa Monica was quickly rebuilt. In San Francisco proponents of rebuilding the Central Freeway were awed by the speed of post-earthquake rebuilding in Los Angeles. Across the bay in Oakland, the Cypress Freeway, also shaken down by Loma Prieta in 1989, was under reconstruction by the mid-1990s, despite protests and mixed reviews from some neighborhood residents. Protests in Oakland did not stop the rebuilding of the Cypress Freeway, and this fact was not lost on proponents of rebuilding the Central Freeway. In San Francisco, conservatives were none too thrilled with the city’s second freeway revolt. Against that backdrop, a group of pro-freeway business interests formed a Central Freeway Coalition in 1996 to counter progressive organizing. The Central Freeway Coalition was a business group and included all of the automobile dealerships in the vicinity of the Van Ness Auto Row as well as businesses and institutions that considered automobile access by freeway to be crucial, such as the San Francisco Ballet, hotels on Van Ness Avenue, and a number of real estate agencies, law firms, restaurants, and local shops. 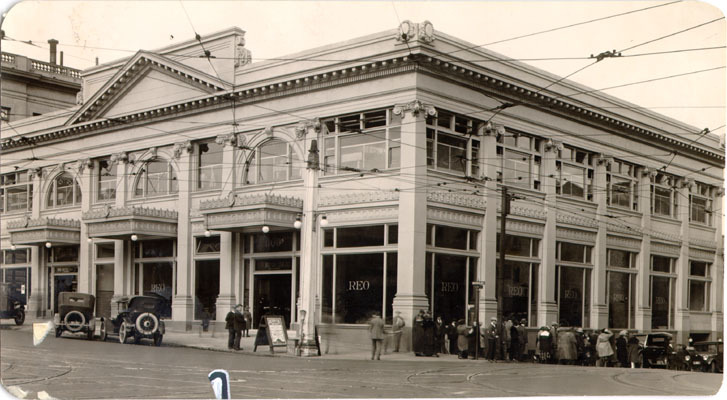 Auto dealership at Van Ness and Geary, 1923. 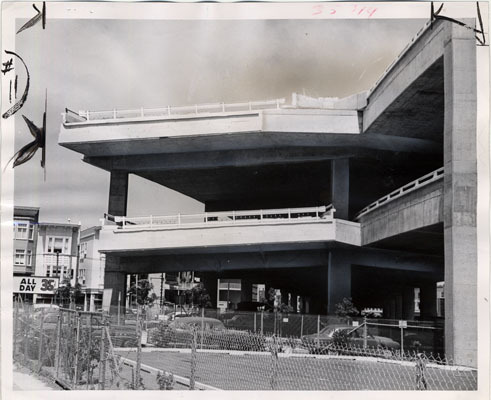 The Central Freeway Coalition advocated for Caltrans to fully rebuild the freeway as an elevated, single-deck crossing over Market Street and connecting the Fell and Oak couplets with new ramps. In an op-ed in the San Francisco Chronicle the Central Freeway Coalition argued that San Francisco’s sales tax base would decline because auto-oriented costumers would shop elsewhere and that this in turn would kill the retail viability of the Van Ness corridor and the downtown. (20) The group claimed that retail jobs would then be lost and that the performing arts institutions at the Civic Center would lose patronage. They lobbied the city’s political establishment and sent representatives to public hearings on the freeway. The Central Freeway Coalition also allied with the California Academy of Sciences, which was located in Golden Gate Park and was dependent on regional automobile access via the Fell and Oak couplet, as well as with some residents and businesses of the Sunset and Richmond Districts. These west-side interests wanted to preserve automobile access to the freeway via the Fell and Oak one-way couplets. The coalition’s reasoning was that cars were natural, necessary for economic activity, and not going away, invoking a conservative essentializing discourse about automobility and the freeway. Freeway proponents sought to spin the livability discourse to favor the freeway. They reasoned that a rebuilt elevated freeway would keep traffic off local streets, making it safer to walk, and that the elevated structure would minimize disruption to Muni operations on Market Street and Haight Street, two key transit routes. Some also promoted a tunnel variation that had aesthetic appeal, although it was extremely costly compared to an elevated structure. Members of the Central Freeway Coalition wrote letters to the editor of both dailies, the San Francisco Chronicle and the San Francisco Examiner, accusing Hayes Valley neighborhood activists of being NIMBYs concerned only about property values at the expense of citywide mobility needs and framing progressive transportation advocates as obstructionist. A second front in the movement to rebuild the freeway came out of a new west-side Chinese American faction with a conservative politics toward automobility. Beginning in the 1980s and through the 1990s, Chinese Americans moved into the west side, using their frugal savings and pooling their incomes to buy homes, and, as they moved, many of these households enthusiastically adopted automobility. Politically active white conservatives courted the new Chinese American property-owning class on the west side as early as 1991. (21) White conservative organizations financed voter registration drives among the Chinese American electorate, and conservative Chinese voters defected from the politically liberal Chinatown establishment that had been in power since the late 1960s. The new conservative, home-owning and car-driving Chinese electorate voted for the conservative Jordan for mayor in 1991, aiding in the defeat of the progressive Agnos. Chinese American conservatives were pro-growth and antitax, and they favored less government and reductions in social services. Jordan returned the favor of this voting bloc by getting the planning commission, which he appointed, to change the planning code to allow more housing on the west side, albeit not the kind of high-density housing found in eastern parts of the city. The San Francisco Neighbors Association coalesced out of this politics. It promoted new family homes with abundant parking and often characterized by large, unsightly garage doors facing the street and commanding the entire width of the front of the house. They linked to federally funded social service programs for assimilating immigrants and were part of a cluster of nonprofits with strong bonds to the civil rights movement. These nonprofits organized lower-income Chinese immigrants and helped them settle in Chinatown as well as in Visitacion Valley and the Excelsior on the south side of the city. On the other hand, middle-class Chinese American property owners tended to be more conservative and ally with traditional west-side conservative politics, particularly on transportation. Through the San Francisco Neighbors Association, these conservatives were politically organized and sought to usurp power from the progressive Chinatown faction. They used a Cantonese-language radio program as an organizing tool because many of the new Chinese homeowners were not proficient in English. Conservative advocates used the radio forum to agitate and stoke the anger of their audience over the proposal to tear down the Central Freeway. Many of the listeners were personally indebted to Chinese American leaders who had helped them buy property, often at low prices relative to the east side of the city, and so they trusted and deferred to this leadership in local politics. In the meantime Caltrans gave the debate added momentum in 1995 and 1996. Just as progressives pushed harder for removal and conservatives pushed back, Caltrans circulated an internal memorandum stressing that the freeway segment from Mission Street to Fell Street was in danger of imminent collapse. (25) The memo urged Caltrans to immediately under-take a complete rebuilding or retrofitting of the freeway from Mission to Fell, irrespective of the more deliberative planning process then under way. It warned that the upper deck of the structure would collapse in the event of an earthquake and that the probability of another earthquake occurring was high. The Central Freeway at Fell and Octavia streets, August 12, 1965. Embellishing the prophecy of a traffic nightmare, the Department of Parking and Traffic (DPT) floated a traffic management proposal to convert some residential streets in Hayes Valley into one-way arterials to detour traffic through the area. The DPT asked Caltrans to open vacant lots adjacent to the freeway for residential parking so on-street parking could be removed to create additional travel lanes. The DPT’s position was that if the freeway was removed, city surface streets had to be reconfigured to accommodate the corresponding increase in the amount of traffic, reflecting the logic that created one-way couplets throughout the city in the 1950s and 1960s. In a follow-up study of the freeway closure, traffic counts, surveys of motorists, and focus groups of former freeway users revealed that 76 percent of drivers used another ramp to access the regional freeway system, including 19th Avenue. (29) Up to 11 percent of motorists shifted their trip entirely to city surface streets, 2.2 percent of drivers shifted to transit, and 2.8 percent of drivers no longer made the trip previously made on the freeway. Caltrans concluded that a public information campaign alerting drivers of alternatives was a success and that drivers experimented with options and learned new ways to navigate the city by car. The evidence was that a traffic nightmare did not ensue after a segment of urban freeway was removed without a replacement boulevard. This reinforced progressives’ arguments for full freeway removal, but that in turn alarmed the proponents of rebuilding, compelling them to act more aggressively. In March 1997, nine months after closure, pressure to reopen the Fell Street ramp mounted. The California Academy of Sciences urged its members to write to the mayor and the Board of Supervisors to support the rebuilding of the Central Freeway. (30) The academy alleged that its attendance was suffering because the Central Freeway was not yet rebuilt. Merchants in the Upper Haight claimed that their businesses were suffering because the freeway was down. The San Francisco Chronicle lamented that Hayes Valley was dictating the terms of the discussion and called for citywide participation in the debate. (31) A new transit advocacy organization, Rescue Muni, established to advocate from a neoliberal, businesslike perspective for improvements to Muni, weighed in, suggesting that Muni was stuck in the traffic of the closed freeway. (32) Yielding under all of that pressure, city officials reopened the Fell Street ramp in April 1997. Complementing the reopening of part of the freeway, a new environ-mental impact assessment, required by the Federal Highway Administration and heavily influenced by Caltrans and city traffic engineers, provided more ammunition for proponents of rebuilding the entire freeway. (33) The environmental assessment used conventional traffic engineering techniques that predictably forecast congestion and assumed that automobile use would grow. It warned that freeway removal would cause widespread congestion at intersections throughout the Market and Octavia area and add an average of five minutes’ travel time for a motorist previously using the Fell Street ramp. It warned that businesses in Hayes Valley, Japantown (to the north of Hayes Valley on Geary), and in the Haight-Ashbury would decline owing to the removal of the Fell Street ramp and the increased travel times for motorists. (34) It cited self-reported anecdotal evidence from west-side businesses that claimed delays in daily deliveries and stated that the Academy of Sciences and the Exploratorium in the Marina District had a decline in patronage attributable to ramp removal. Last, the report reiterated Caltrans’s position that freeway removal would cause a traffic nightmare on the mainline US 101 and I-80. The environmental impact assessment essentialized automobility, characterizing increased automobility as inevitable. The language and tone of the report clearly advocated the rebuilding of the freeway. The report did not consider that in the future there could be less traffic and more bicycling and transit use. Fundamentally the analysis presumed the continued dominance of automobility and never entertained the idea of transit-first treatments to streets and increased walking or bicycling; it looked solely at the traffic impacts in the immediate area, assuming that all the existing freeway users would converge there, despite contrary evidence that traffic dispersed after the entire freeway was temporarily shut down months before. Supervisor Sue Bierman, a progressive of freeway revolt fame in the six-ties, and other board members requested that the city undertake its own review, and the resulting report was skeptical of the conclusions drawn in the environmental impact assessment promoted by freeway proponents. The second opinion, by the San Francisco County Transportation Authority (SFCTA), suggested that the environmental assessment and other Caltrans reports on traffic were confusing and conflicting. (37) It highlighted that full removal was actually the cheapest of the alternatives analyzed and that removal would distribute traffic in such a way that it was more dispersed and thus equitable because no single neighborhood was absorbing the brunt of automobility. The SFCTA’s second opinion also argued that even though more intersections would be congested by removing the freeway, the congestion was really acute only during rush hour while at most other times of the day freeway removal would not cause traffic. The report hinted that Hayes Valley was being sacrificed for rush hour traffic. The SFCTA warned that regardless of which alternative was chosen there would be cost overruns and a lengthy construction period. The full rebuilding of the freeway would take four to five years and thus be the most disruptive option. As was the case with the temporary shutdown of the freeway in 1996, traffic would have to be rerouted and dispersed throughout the city, but this time for up to five years. Motorists would behave rationally, as they had before, and find detour routes and establish new patterns that exhibit that the freeway was not necessary. Full re-building was also the most expensive of the options in overall engineering and construction costs and would have a major funding shortfall because emergency funds set aside after the earthquake in 1989 were depleted and no other funds identified. The SFCTA report did not explicitly select a preferred option, but the comparison of the alternatives was least enthusiastic about rebuilding an elevated freeway to Fell Street. There were now two sets of evidence in front of the public. One, the environmental impact assessment conducted by the Federal Highway Administration with the collaboration of Caltrans and city traffic engineers stressed that if the freeway to Fell Street were not rebuilt a traffic nightmare would engulf much of the eastern half of the city. The second report, requested by progressives on the Board of Supervisors and conducted by the board-controlled SFCTA, suggested that not rebuilding the freeway would be manageable and that traffic would disperse. Both sides dug in. Progressives were armed with both a report and physical evidence from the temporary shutdown that a traffic nightmare would not occur with removal. Conservative activists had their own evidence and data that warned that continued future growth in automobility would overwhelm the city unless the freeway was rebuilt. This pushed conservative activists into a deeper political commitment to rebuild. In the meantime, neoliberals, the heirs to the Keynesian business elites, etched out a role in the debate as well. After the earthquake in 1989 part of the decision to tear down the Embarcadero Freeway had a neoliberal hue, that is, using market forces to shape transportation policy in what was ostensibly a privileged space along the waterfront. Special legislation was crafted that required the city to provide an adequate surface street to handle the traffic previously carried by the freeway, today’s Embarcadero Boulevard and Promenade. Built into the legislation was a financing scheme stipulating that the land parcels beneath the former freeway be sold at market rates and that the proceeds be used to help finance construction of the boulevard. Real estate speculators and global corporations like the apparel giant the GAP would purchase signature waterfront properties on some of the former freeway parcels, a beautifully landscaped waterfront promenade and boulevard were constructed, and those same parcels, now privatized, doubtless increased even more in value. A few blocks inland, other former freeway parcels were part of this approach, eventually including a handful of luxury high-rise condominium projects. This financing scheme reflected an emerging neoliberal turn in cities and signaled a retreat from Keynesian policies for public finance. Neo-liberalism accompanied a substantial retrenchment in federal funding of urban programs during the 1980s, forcing localities to take on more of the burden for providing local needs like transportation. In California this retrenchment was accentuated by the passage of Proposition 13 in 1978, which froze local property taxes to 1975 values, limited the rate for reassessing property values, and required a two-thirds supermajority vote in a plebiscite for any local special tax increases, such as for transportation. The combination of federal and state defunding of urban infrastructure meant that cities like San Francisco had scarce resources to take on the removal or replacement of a freeway. To compensate for the loss of public finance, the land, some of which was held by the city redevelopment agency, was sold at market rate. As the Central Freeway was debated in the mid-1990s, the neoliberal financing arrangement gained traction among some progressives, signaling a rapprochement with the city’s neoliberal land development class. Progressive advocates recognized that money, not just conservative opposition, stood in the way of freeway removal. Activists in Hayes Valley and in the broader sustainable transportation movement came to cautiously accept the notion that adopting the neoliberal approach of land sale could be the best way to achieve their vision of removal. However, while progressives were overwhelmingly in favor of eliminating the freeway and conservatives adamantly opposed to it, the neoliberal land development class had a disjointed, ambivalent view of the matter, reflecting a broader ambivalence toward automobility. The SFPD, as proxy for the development class, was promoting Hayes Valley as an area well suited to dense, transit-oriented housing and invoking the emerging livability discourse. Yet it paradoxically called for doubling the number of parking spaces in the Performing Arts garage adjacent to the arts venues, signaling that generous automobile access to entertainment was still a priority for city planners, and it assumed abundant parking in the new housing developments as well. (40) The consideration of the Central Freeway required neoliberals to weigh these competing out-comes, and the decision to rebuild or remove the freeway was not as clear-cut to them as it was to progressives and conservatives. Neoliberal ambiguity offered openings to progressives, exposed fissures in the political landscape, and further agitated the entire public planning process around the freeway. Brown was ridiculed as well by pro-freeway advocates. (46) The Central Freeway Coalition urged that no demolition of the freeway occur until money for rebuilding was identified and an environmental report was conducted. The group’s position was that the upper deck should be removed for safety reasons, but that the retrofitting of the lower deck should be done in a permanent manner, not just temporarily, as suggested in the agreement between Brown and Caltrans. They were worried that Brown would have parts of the freeway removed temporarily and then claim there was no money left for rebuilding. The confusing, ambivalent positions on the freeway became more pronounced when Brown, after dithering multiple times, came to appreciate the idea of a surface boulevard north of Market Street rather than an elevated freeway. Pressed on by progressive planners who wished to remain anonymous, Brown directed the planning department to draw up renderings of a hypothetical Parisian-style boulevard with new buildings on land that once lay beneath the freeway. Brown had the renderings displayed at his State of the City speech in 1997, and he loosely endorsed the concept. The development potential of the former freeway parcels had convinced the mayor that there was an economic benefit to freeway removal, and this suggested neoliberal compromise with an otherwise progressive idea. The city next recruited the former director of the SFPD Allan Jacobs and his partner, Elizabeth MacDonald, who had researched boulevards in other cities, notably Paris and Barcelona. (47) The pair proposed a boulevard with six lanes, two of which were side lanes with on-street parking. The four inner lanes were divided by landscaped medians and separated from the outer parking lanes by more landscaped medians. Two wide side-walks rounded out the edges of the boulevard plan. With Mayor Brown’s approval, a political consensus was emerging between progressives and neoliberal land developers that the freeway would be torn down north of Market Street. The consensus partly addressed progressives’ broader agenda of challenging automobility and promoting livability. To neoliberal developers, the land underneath the former freeway signaled opportunity for profit. There was no real, lasting, solidified coalition between progressives and neoliberals so much as the seedlings of an ad hoc agreement that the removal of a short segment of freeway benefited both neoliberal developers and progressives. Progressives knew that if they were to achieve freeway removal they had to have political allies beyond their normal bailiwick of environmentalists and sustainable transportation advocates. Therefore, by 1997 ASTAC was promoting freeway removal not simply as a tactic against automobility but also as an economic development tool that would benefit private developers. In sum, this was a tacit settlement between neoliberals and progressives that shunted aside the conservative vision of a full freeway rebuild. The rapprochement would be tested in three rounds of ballot-box planning for the Central Freeway. 20. Carolyn Diamond, Ann Lee Harris, and Roger Boas, “The Best Central Freeway Plan,” San Francisco Chronicle, July 18, 1996. 21. David Lee, “Storming the Gates: San Francisco’s Emerging Chinese American Electorate” (M.A. thesis, San Francisco State University, 2003), 72. Lee discussed how, in 2000, Asians, of which Chinese Americans are the largest group, made up 55 percent of voters in the Sunset and 49 percent of voters in the Richmond. 23. The Six Companies were an anticommunist affiliate of the Kuomintang and despised leftist politics. 25. Subcommittee of the Peer Review and Technical Advisory Panel for the Seismic Evaluation and Strengthening of the San Francisco Double Deck Freeway Viaducts, “Letter to Mr. James W. Van Loben Sels, Director, Caltrans: Seismic Retrofit of the Central Freeway Viaduct in San Francisco,” December 6, 1995. In early 1996 there was extensive front-page media coverage of the Caltrans warnings; for example, see Greg Lucas and Catherine Bowman, “Central Freeway Plan Gets Green Light: Brown OKs Removal of Quake-vulnerable Deck,” San Francisco Chronicle, February 7, 1996, and Gerald D. Adams and George Raine, “S.F. Sets Course for New Midtown Gridlock,” San Francisco Examiner, February 8, 1996. 26. Greg Lucas and William Carlsen, “S.F. Freeway to Close for Six Months, Traffic Nightmare Expected during Retrofit,” San Francisco Chronicle, February 24, 1996. 27. James W. van Loben Sels, Director, Caltrans, “Letter to Mayor Willie Brown Regarding Seismic Retrofit of Central Freeway,” February 13, 1996. 28. Edward Epstein, “Freeway Traffic Dips in S.F., Oakland: Caltrans Credits Central Freeway Gridlock Warnings,” San Francisco Chronicle, September 4, 1996. 29. Caltrans, Central Freeway Closure: Initial Traffic Impacts—Final Report (Oakland: Office of Highway Operations, Caltrans District 4, 1996), 1–7. 30. John King, “Brown Pledges to Unclog Central Freeway Detour Traffic,” San Francisco Chronicle, March 12, 1997. 31. San Francisco Chronicle, Editorial, “Re-open the Central Freeway,” March 13, 1997. On Haight Street merchants, see Rachel Gordon, “City Says “No Thanks’ to Fell Street Off-Ramp,” San Francisco Examiner, March 14, 1997. 32. Rescue Muni, “Letter to the Editor, Rescue Muni Review,” San Francisco Chronicle, March 27, 1997. 33. FHWA and Caltrans, San Francisco Central Freeway Replacement Project; see esp. “Traffic and Circulation, 44–55. 35. Alex Barnum, “All Options for Central Freeway Draw Wrath in S.F. as 300 Attend Raucous Session Sponsored by Caltrans,” San Francisco Chronicle, April 24, 1997. 36. The State of California requires every county with a population of over two hundred thousand to have a “congestion management agency.” In San Francisco that agency is the SFCTA. Created in 1989 by referendum, the SFCTA also oversees the management of the city’s transportation sales tax and coordinates funding to the various local transportation programs, such as Muni. It is the fiduciary agent for transportation in the city, separate from SFMTA for political reasons beyond the scope of this discussion. The Board of Supervisors is the committee that governs the SFCTA, and any member of the board can ask the SFCTA to conduct transportation studies. 37. SFCTA, Strategic Analysis Report 97-1: Central Freeway Alternatives (San Francisco: SFCTA, 1997), 1–9. 38. SFPD, Civic Center Study (San Francisco, SFPD, 1994): 98 and 101. 42. Larry D. Hatfield, Gerald Adams, Gregory Lewis, “Deal Near on Fixing Central Freeway,” San Francisco Examiner, February 7, 1996. 43. Ephraim Hirsch, “Neighbors Want the Central Freeway to Become a Bad Memory,” San Francisco Examiner, March 13, 1996. Hirsch chaired the CFCTF. 44. John King and Greg Lucas, “Brown Wants Freeway Ramps Demolished, Proposal Could Snarl S.F. Traffic for Years,” San Francisco Chronicle, March 26, 1996. 45. Gerald Adams, “Central Freeway Fix, Replacement Plan Draws Critics,” San Francisco Examiner, June 5, 1996. 46. San Francisco Chronicle, “Groups Seeks to Halt Demolition of Freeway,” May 16, 1996; Carolyn Diamond, Ann Lee Harris, Roger Boas, “The Best Central Freeway Plan,” San Francisco Chronicle, July 18. 47. The city hired Jacobs and MacDonald after the CFCTF explicitly asked that the duo get involved.